Marileen Dogterom, Professor of Bionanoscience at TU Delft, has been awarded the NWO Spinoza Prize; the highest award in Dutch science. Dogterom carries out research into the dynamics in living cells and leads a consortium which is aiming to build an entirely artificial cell. This work helps scientists to understand how basic cell processes work, as well as what goes wrong in certain disorders. Dogterom is one of the four researchers who have each been awarded 2.5 million euros for scientific research. 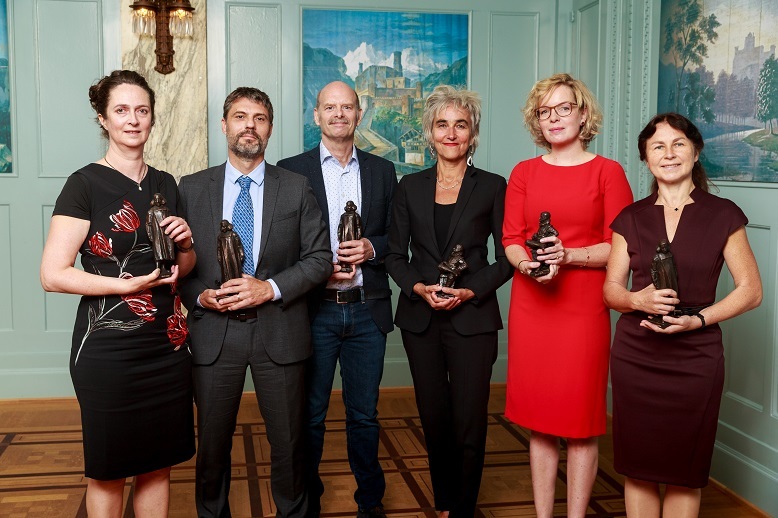 Minister Ingrid van Engelshoven of the Ministry of Education, Culture and Science presented the awards in the Koninklijke Schouwburg in The Hague on 12 Sseptember 2018. Prof. Marileen Dogterom (left) is chair of the Bionanoscience Department of the Kavli Institute of Nanoscience at TU Delft. The other recipients of the 2018 Spinoza Prize are Professor Anna Akhmanova (Professor of Cellular Dynamics at Utrecht University), Professor Carsten de Dreu (Professor of Social and Organisational Psychology, Leiden University) and Professor John van der Oost (Professor of Microbiology, Wageningen University & Research). Prof. dr. A.M. (Marileen) Dogterom (1967) is chair of the Bionanoscience Department of the Kavli Institute of Nanoscience at TU Delft. She became world famous for her experimental research on the forces generated by the cytoskeleton. The cytoskeleton is a kind of molecular ‘frame’ that gives the cells of yeast, plants, animals and humans their shape and sturdiness. It also plays a vital role in cell division. Dogterom was the first to measure the forces generated by the microscopic tubules of that cytoskeleton during cell division. This knowledge helps us to understand how healthy cells function – and therefore also what goes wrong at the molecular level with afflictions such as cancer. That creates opportunities for treatments, but also for synthetic biology: building functional, artificial cells from molecular building blocks. Early on in her career, Dogterom was already publishing ground-breaking studies in well-known scientific journals – and she continues to do so. She has taken her field to new heights, both in the Netherlands and internationally. She initially achieved this at the FOM Institute AMOLF and later at the universities of Leiden and Delft. She also made important contributions to the development of biophysical techniques. One example is a laser technique called ‘optical tweezers’, which enables its user to measure the forces generated by individual molecules. Video animation ’BaSyC: Building a synthetic cell, bottom-up’ by Enrique Sahagún. Dogterom is one of the most important faces of biophysics in the Netherlands. She is the driving force behind the national consortium BaSyC (Building a Synthetic Cell). BaSyC seeks to improve our understanding of the basic physical-chemical processes of life by building an artificial cell bottom-up. BaSyC consists of six research institutes and is supported by a Gravitation grant worth 19 million euros. Since 2016, Dogterom has also been a ‘Medical Delta’ professor. The ‘Medical Delta’ programme is a partnership between various research institutes in Delft, Leiden and Rotterdam; it was set up to build a bridge between science and medical practice. Internationally, Dogterom also works in a major, leading network with colleagues from Stanford, Harvard and the Max Planck Institute. In 2013 she was elected a member of the European Molecular Biology Organization (EMBO), the most important European organisation of academics working in the life sciences. That same year she received a prestigious Synergy Grant from the European Research Council (ERC), with her fellow-Spinoza laureate Anna Akhmanova. Dogterom is known as a warm personality who commits herself passionately to her students and colleagues. She likes to contribute to courses and summer schools and began a discussion network for young researchers working in biophysics in the Netherlands. Dogterom is also vocal when it comes to scientific policy. Indeed, she is a board member of KNAW, co-wrote the vision paper ‘Chemistry & Physics: Fundamental for Our Future’ and was involved in the development of the Dutch National Research Agenda. Dogterom likes to give lectures to pupils and teachers. She contributed to innovations in how physics is taught at secondary schools. She is also regularly interviewed in national media. She has appeared in popular events, such as De Wereld Leert Door, the Nationale Wetenschapsquiz and the Avond van Wetenschap & Maatschappij. The NWO has been awarding the Spinoza Prize annually since 1995 to a maximum of four scientists who are at the top of their international field. This year's awards ceremony will take place on Wednesday 12 September in the Koninklijke Schouwburg in The Hague. During the presentation, the Spinoza Laureates will explain their research and what they will be using the prize money for.